BLOUNTVILLE — Sullivan County’s school board unanimously approved hiring a new construction manager for the under-construction West Ridge High School and Sullivan East Middle School at Tuesday night’s meeting. The Board of Education also delayed a vote authorizing a potential lawsuit against the County Commission over sewer line funding and heard from about 30 folks upset about potential closures of three schools in May. The board voted 7-0 to hire Michael S. Royston, owner and founder of Impact Builders, Inc. and a contractor for the First Tennessee Development District, for $45,000 a year. The contract is to run through Dec. 31, 2020, but could be extended, and he is to be provided a county vehicle, cell phone, computer and camera, as well as reimbursement for expenses as a contract employee. He will work under maintenance and custodial supervisor Charlie Hubbard. WHY WAS LAWSUIT VOTE DELAYED? The BOE delayed consideration of authorizing attorneys to sue the Sullivan County Commission for not allowing the school system to use $1,025,000 in restricted fund balance to pay for a sewer line to serve the new middle school. A work session was set for Jan. 15, to be followed by a called meeting, at which board attorney Pat Hull and Nashville education attorney Chuck Cagle could meet with the BOE in executive session, school officials said. County Commissioner Mark Hutton of Bristol, one of 15 new commissioners sworn in last year, said during the public comment period that he wants to “invite a conversation with you as much as possible” on financial issues. The previous commission cut a $1.6 million renovation fund, diverting that money to bonds for the new schools, but the new one denied the school system permission to use the restricted reserves for the sewer project. WHAT WAS GIST OF PUBLIC COMMENTS? 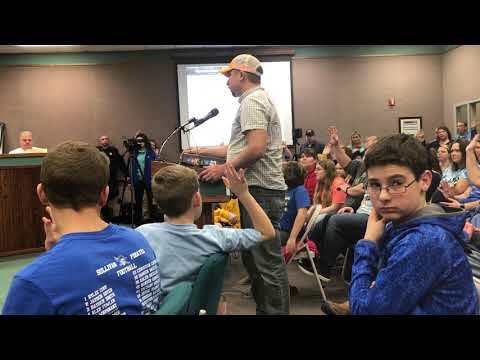 The board got an earful from students, parents, teachers and community members, with speakers urging the BOE not to close Innovation Academy of Northeast Tennessee for good and Blountville Middle School and the middle school portion of Sullivan Gardens K-8 two years earlier than planned. About 150 people attended the standing-room-only meeting, some standing in a hallway. 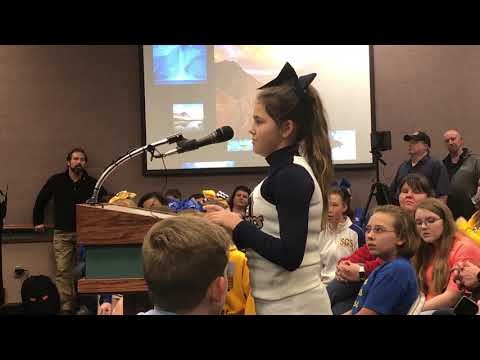 In a nutshell, the speakers said they see no reason to upset Blountville and Sullivan Gardens. Blountville Middle students would go to Holston Middle, then to Sullivan Central High, converted to a middle school when West Ridge is completed in 2021. Sullivan Gardens students would move to Colonial Heights, then Sullivan South High, converted to a middle school. Supporters of IA said the STEM (science, technology, engineering and math) school is highly effective and is needed to fill a STEM gap in public education. It was scheduled to be moved inside the new Central Middle in 2021. The seven-member board is considering the three closings as a cost-saving option to offset almost $2 million — a $1.6 million loss in renovation funding from the County Commission and $370,000 going toward new school resource officers. Closing the three would save up to $1.4 million, Director of Schools Evelyn Rafalowski said; however, board Chairman Michael Hughes said that a vote on those ideas might not come until April and that other ideas could be added or existing ones taken away. No decisions have been made, he said. Other speakers complained about longer bus rides and what they called a lack of a transportation study for West Ridge, which will take the place of Sullivan North, South and much or all of Central high schools, while some said smaller schools and lower pupil-teacher ratios are better. WHAT DID SPECIFIC SPEAKERS SAY? Stacy DeBord of Jonesborough, parent of an IA sixth-grader, said her daughter wants to become a veterinarian and the school helps prepare her for that better than any others in the area by emphasizing problem solving in a team-based approach. “We don’t work on an island anymore,” DeBord said of most jobs, including hers in finance. Blountville Middle teacher Leslie Carr asked “why disrupt twice instead of once?” over three years. Cindy Davis-Peterson of Sullivan Gardens said the closings would “jerk the rug” from under students, while Sullivan Gardens Recreation Association Secretary Missy Sturgill said the school system needs to “use what you’ve been given” for maintenance and renovation before the commission gives it more. Ashley Cross said two of her children have special needs and would be hurt by moving from Blountville to Holston to Central and then West Ridge over the course of four years. “My kids need stability like all kids need stability,” Cross said.